To display a scene, you must designate a node whose camera property contains a camera object as the point of view. An SCNCamera object itself defines the shape and, in part, the appearance of the rendered scene as seen from its point of view. By default, a camera defines a perspective projection, whose field of view (FOV) and near and far visibility limits you control using the properties listed in Adjusting Camera Perspective and illustrated below. Creates a new camera object. Creates a camera from the specified Model I/O camera object. A name associated with the camera object. The camera's near depth limit. Animatable. The camera’s far depth limit. Animatable. A Boolean value that determines whether the camera automatically adjusts its zNear and zFar depth limits. The vertical or horizontal viewing angle of the camera. The camera's focal length, in millimeters. The vertical size of the camera's imaging plane, in millimeters. The axis used to determine field of view or orthographic scale. Options for the axis used to determine field of view or orthographic projection. 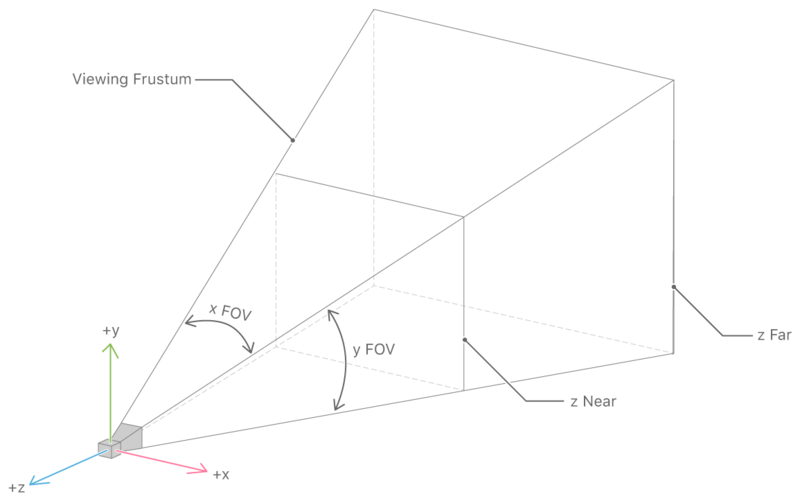 A Boolean value that determines whether the camera uses an orthographic projection. Specifies the camera’s magnification factor when using an orthographic projection. A mask that defines which categories this camera belongs to. A Boolean value that determines whether SceneKit renders depth-of-field blur effects for the camera. The distance from the camera at which objects appear in sharp focus. Animatable. The physical camera aperture simulated by SceneKit for depth-of-field effects. Animatable. The number of physical camera aperture blades simulated by SceneKit for depth-of-field effects. The number of pixel samples SceneKit uses to create depth-of-field blur effects. A factor that determines the intensity of motion blur effects. Animatable. A Boolean value that determines whether SceneKit applies High Dynamic Range (HDR) postprocessing effects to a scene. A logarithmic bias that adjusts the results of SceneKit’s tone mapping operation, brightening or darkening the visible scene. The luminance level to use as the midpoint of a tone mapping curve. The luminance level to use as the upper end of a tone mapping curve. The minimum exposure value to use in tone mapping. A Boolean value that determines whether SceneKit automatically adjusts the exposure level. The relative duration of automatically animated exposure transitions from dark to bright areas. The relative duration of automatically animated exposure transitions from bright to dark areas. An adjustment factor to apply to the overall visual contrast of the rendered scene. An adjustment factor to apply to the overall color saturation of the rendered scene. A texture for applying color grading effects to the entire rendered scene. The magnitude of bloom effect to apply to highlights in the rendered scene. Animatable. The brightness threshold at which to apply a bloom effect to highlights in the rendered scene. Animatable. The radius, in pixels, for the blurring portion of the bloom effect applied to highlights in the rendered scene. Animatable. The blend factor for fading the color fringing effect applied to the rendered scene. The magnitude of color fringing effect to apply to the rendered scene. The magnitude of vignette (darkening around edges) effect to apply to the rendered scene. The amount of the rendered scene to darken with a vignette effect. The intensity of the screen-space ambient occlusion effect applied in camera rendering. The distance, in units of scene space, at which ambient occlusion takes effect. An offset for modulating ambient occlusion effects. The maximum depth difference, in units of scene space, at which to apply ambient occlusion effects. The magnitude of the blur effect applied to create ambient occlusion shadows. The camera’s field of view, in degrees, on the vertical axis. Animatable. The camera's field of view, in degrees, on the horizontal axis. Animatable. The width of the distance range at which objects appear in sharp focus. Animatable. The maximum amount of blurring, in pixels, applied to areas outside the camera’s depth of field. Animatable. A factor that determines the transition between in-focus and out-of-focus areas. Animatable.